Turns out, while this blog isn’t about writing you letters, I kinda like it. I’ve found that taking the time to write my words specifically to you, helps me collect my thoughts better and shows that I feel like what I’m saying here is important so I want you to listen up. 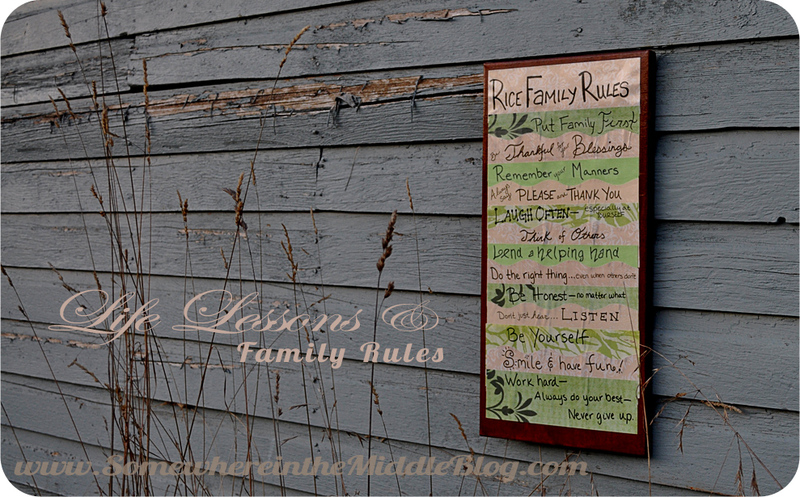 While I was driving home from the grocery store the other day I was thinking about our family rules that we have hanging up next to the front door for all to see. Your father & I try to live by these rules on a daily basis and we hope that you’ll learn them by our actions. You see, these rules are important to your father & I and we want to make sure the expectations are clear. Just because they’re hanging up in our living room, doesn’t necessarily mean you’ll notice them. By the time you’re old enough to read these words, that handmade canvas will likely just blend into the wall and you’ll walk past it like it’s not even there. I’ve decided that for future reference, I’ll highlight one family rule at a time and explain to you why it is important to our family. That way, if you ever wonder, you can always come back here for a refresher. Even though I’m constantly wanting time to just slow down, I am really looking forward to seeing the women you two will become. If your personalities now are any indication of 20 years from now, I couldn’t be more proud of you. You two are my whole world. This entry was posted in Family Rules, Letter to my girls, Sisters on September 30, 2012 by katherine.